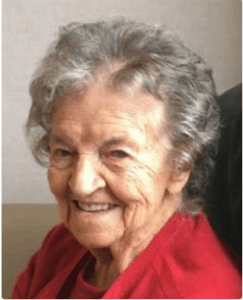 South Grafton – Jacqueline “Jackie” (Mathieu) Moriarty, 90, passed away Nov. 15, 2018 following an illness. She was predeceased by her husband, Walter Moriarty. She is survived by her sons, Michael Moriarty and his wife Barbara and Jeffrey Moriarty and his wife Jeanne; her grandchildren, Michele Estrella and her husband James and Kelly Moriarty; her great-grandchildren, Julia and Olivia Estrella; and her sister, Toni Sullivan, along with many nieces and nephews. She was also predeceased by her siblings, Marie Whittlesey, Jacques “Eddie,” Louis, Alfred and Euclid Mathieu. Jackie went through life sharing her gifts. She was a tremendous cook and put her time and energy into preparing meals at St. Mary’s Church before she formally retired, and earlier in life was a hairdresser. She was happiest when surrounded by family. Guided by her faith she was a Eucharistic Minister and member of the Women’s Guild at St. James Church in South Grafton. She will be greatly missed. All are welcome to a funeral Mass for Jackie Saturday, Nov. 24, at 10 a.m., at St. James Church, 89 Main St., South Grafton. There are no calling hours. She will then be laid to rest at Fairview Cemetery. Please honor her in lieu of traditional remembrances with a donation to The Grafton Food Bank, PO Box 324, Grafton, MA 01519. A Book of Memories to share a favorite story or message of sympathy with her family is available online at www.RoneyFuneralHome.com.